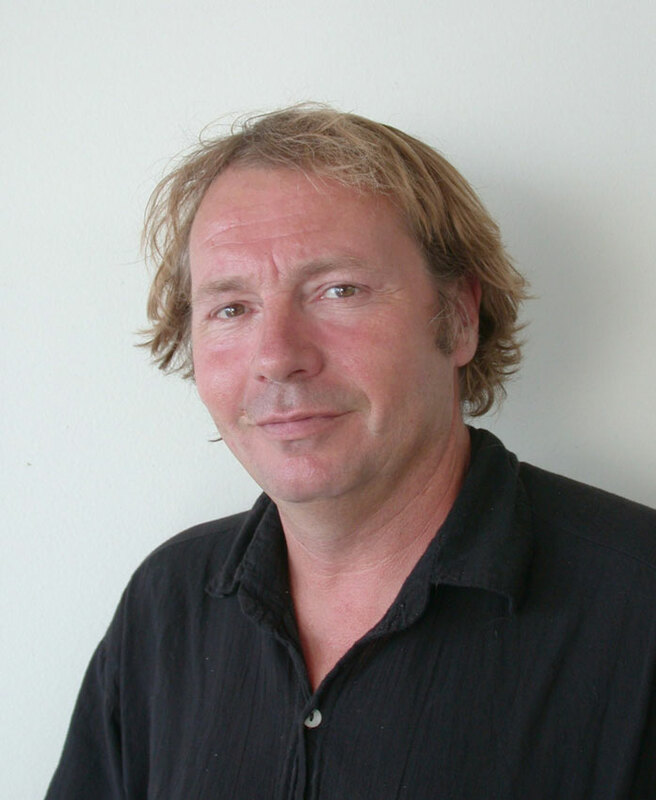 Marc Lombard is a naval architect of great repute, who is responsible for a number of well known racing one designs, such as the Figaro Bénéteau, as well as many innovative monohull yachts for competitors in round the world and trans-Atlantic races. 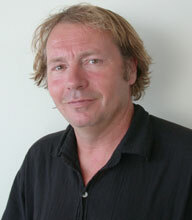 As a multihull designer, he has a reputation for innovation and is the inventor of the curved foil, having first fitted these to the trimaran Banque Populaire 2 in 1999. The use of such foils - a real revolution at the time - has now been adopted by almost all the large trimarans, for racing and round the world record attempts. BYM News asked for his impression of the recently revealed BMW Oracle 90 foot trimaran. My first impression was that of a total lack of imagination, the project, as I expected is nothing other than a super Orma. Taking over our curved foils and the pivoting mast… that’s already on all the Orma trimarans. This project does not hold any surprise, except for the accumulation of extreme factors. BYM News: This boat is square, like an ORMA trimaran. Can you explain the advantages and disadvantages? ML: The last Ormas that were built, after a period of ‘maximum squareness ‘, were a bit narrower than square, this was a positive evolution, even if the vehicle bears the consequences, the longitudinal stability is limited lengthwise and by the dynamic vertical pressure of the foils, the result is that Oracle is at risk of pitchpoling really quickly and it will require a very reactive crew. It seems that the height of the smallest mast is about 55 metres and the sail area enormous; maybe 40% more than Groupama 3 and even compared to Banque Populaire V. Can you explain the effect - advantages/disadvantages. ML: The yacht will certainly lift the central pod as of 10kts true, which will make it certainly a quick yacht in little wind, but risks making it extremely sensitive when powered up in instable winds. Anyway, an "America Cup" crew should be capable of managing these conditions. There are rumours that the boat only weighs between 7 and 9 tons. Do you think that is possible, or desirable? ML: I think the yacht is heavier than 9 ton "all up", the main reason being that one can not design a yacht outside the maximum static loads. As in the Orma days, the culture of disinformation and wrong data continues. The problem is that the media are hungry for data, even wrong data. The teams too preach disinformation, but that’s part of the game; the "america" battle is first and foremost a psychological battle. It seems to us that this boat has been built for light airs and a relatively flat sea. If you agree, can you point out the dangers if the conditions get stronger? ML: In 20 of knots wind it’s clear that the yacht, with its minimal freeboard, will not be easy to manage efficiently. In fact, a yacht with less sail will, doubtlessly, be quicker and more reliable in 20 knots. Maybe they are considering limiting the matches to 12/15 knots true, that wouldn't embellish the reputation of the cup; the recent reputation of ‘lake yacht’racing wouldn’t change. Whatever the reason, a capsize during the trials or during first racing won’t do much for the multihull concept. This is a pity since these are extraordinary sailing machines, the most exciting in existence. The mast is canting, once again tell us the advantages and disadvantages ? ML: The advantage is a sure gain of performance, because the windpressure remains horizontal and avoids the need for a bigger displacement. The drawback is in the manoeuverability, the mast movement takes at least a couple of seconds and in a match race this will have a limiting impact on tactics. Have you any idea how many people will be needed in the crew? ML: I think a crew of at least 20 people will be needed to manoeuvre this machine correctly. One doesn't know what sort of boat Alinghi is building, but maybe its a hybrid like the famous Le Black. If that's the case, which boat would be likely to win in differing weather conditions? 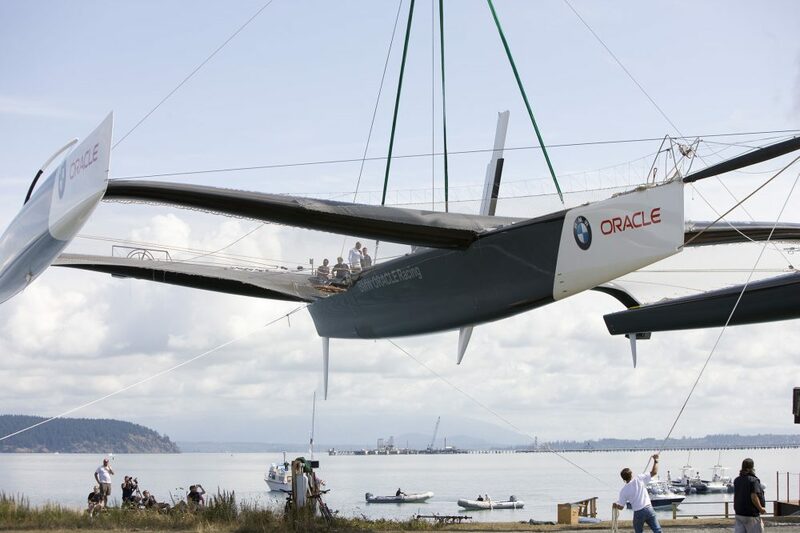 ML: If you are talking about a cat scaled like the 41 foot, it’s certain that a tri like Oracle will be quicker because its wind pressure displacement ratio will always be superior. If a cat were to attain the same performances it would be in very precise wind conditions, because with hulls on the water (little wind) the risk is that the higher wetted area limits the potential and the evolutionary possibilities. In sustained wind the lack of power would be crippling, because when the crew weight is on the lateral net it's not easy to remain tactically alert. It seem to me that a slightly less beamy tri, with less sail and ballastable in stronger winds, would be a better alternative. I also strongly fear there might not even be a race, because of an unplanned premature pitchpole.